Thanks for visiting Louisiana butterflies. The state’s approximately one hundred and fifty butterfly species puts it in the middle of the state butterfly diversity spectrum. Large areas with grassy coverings make it especially fertile ground for Skipper butterflies, whose larvae depend mostly on native grasses. As a Gulf Coast state, most of the species are similar to neighboring state lists. 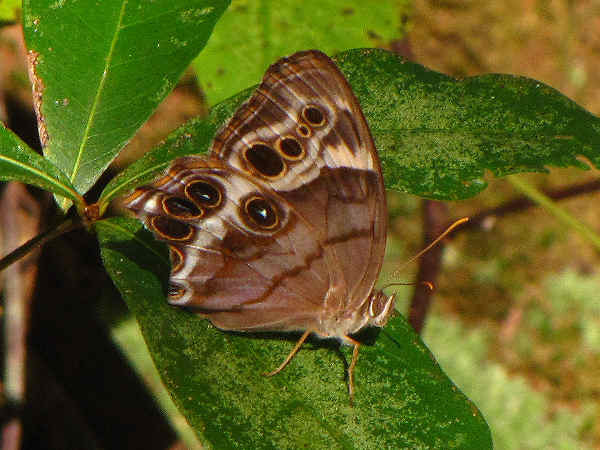 What makes Louisiana butterflies species is that they show up everywhere in the state. Take the New Orleans for example. Visitors need not stray too far to see and photograph these winged creatures. City Park, an outdoor hotspot for relaxing in the down town area has a Butterfly Walk, with native flowers planted to insure that this outside butterfly garden exceeds the expectations of residents and visitors alike. Not to be outdone, the Audubon Butterfly Garden very close to Lafayette Park, hosts a year round tropical butterfly display along with a whole bunch of other insects. This introduction to Louisiana butterflies provides a list of the native species, divided into families. Almost by default it also helps identify butterflies by wing color because color is one of the defining family characteristics. Space limitations mean that only a few butterfly pictures can be presented. Please press the green butterflies button for additional butterfly pictures and identification help. The picture at the top of the page shows a Julia Heliconian, or a longwing butterfly in the fritillary genera. Louisiana tourists have the opportunity to see this and another few subtropical species. Louisiana hosts a large number of butterflies with yellow wings that belong to the family Pieridae. 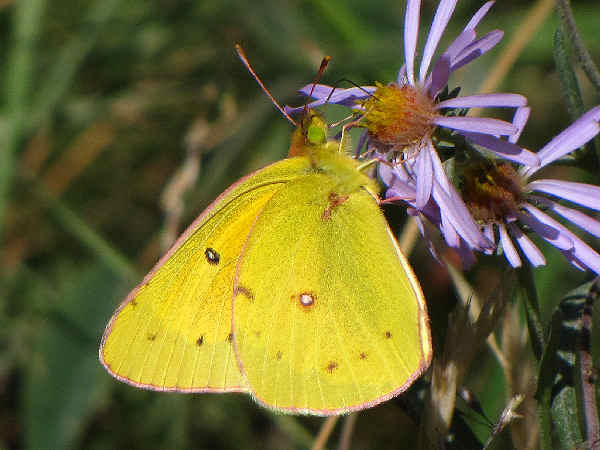 The picture shows an Orange sulphur, a very common species. 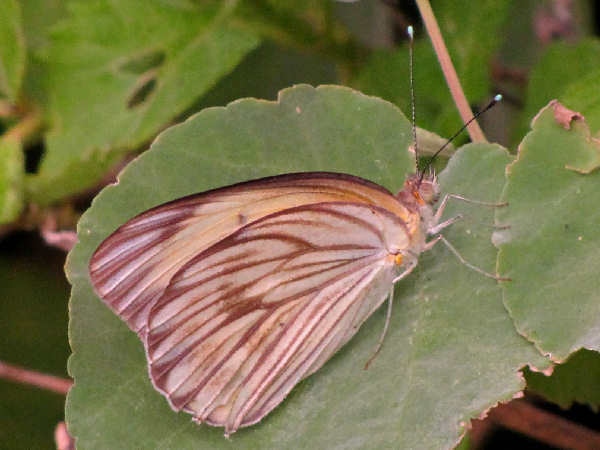 Only a handful of white butterflies have been documented in the state. EVeryone knows the cabbage white. It’s a European import that is found in every neighborhood that has a back yard garden. The larvae consume leaves in the cabbage family. They are very common back yard vegetables. The picture shows a Great Southern White. Because it is a southern species visitors from the north can snap a quick picture and add it to their life list. Look for the blue tips of the antenna as a good field identification clue. No Metalmarks are recorded in Louisiana. The blue butterflies are plentiful wherever on travels. The picture shows a Cassius Blue. It’s a good find for visitors from the West or North because it’s primarily a southern specialty. 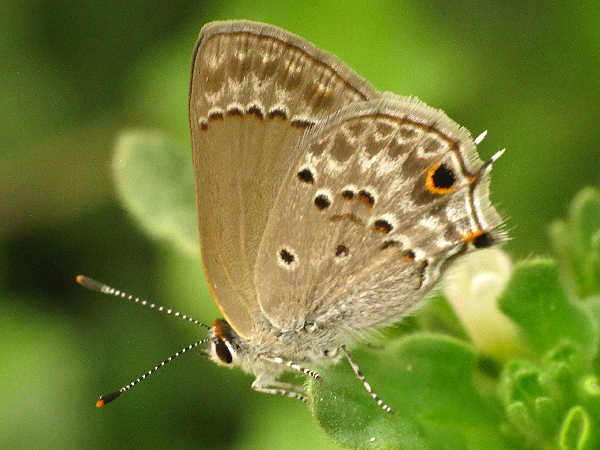 Hairstreaks dominate the Louisiana Gossamer Wing category in the state. The picture shows the very common Mallow Scrub Hairstreak. As a Gulf Coast state with some sub-tropical weather, Louisiana does attract some sub-tropical species such as the Heliconian. Otherwise, many of the same species, such as the milkweed species better known as the Monarchs and Queens can be found in the state, just as they are found in other eastern states. 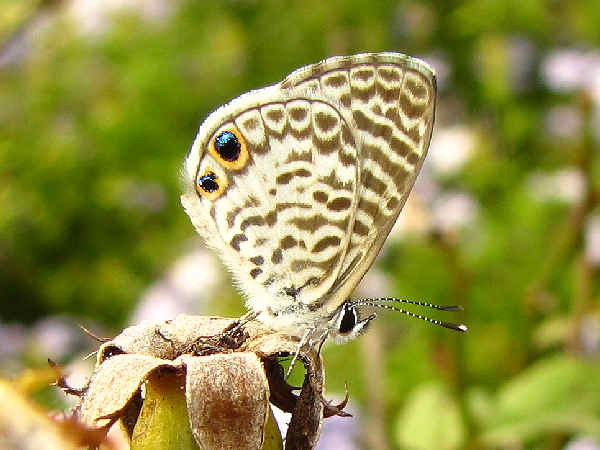 The picture shows a Souther Pearly Eye, one of the Wood Nymph species that call the state home. Many of the remaining brush footed butterfly species are commonly seen in residential areas and gardens around the larger cities. For a southern state, Louisiana hosts a relatively small number of swallowtail species. They are all very common species in neighboring states. 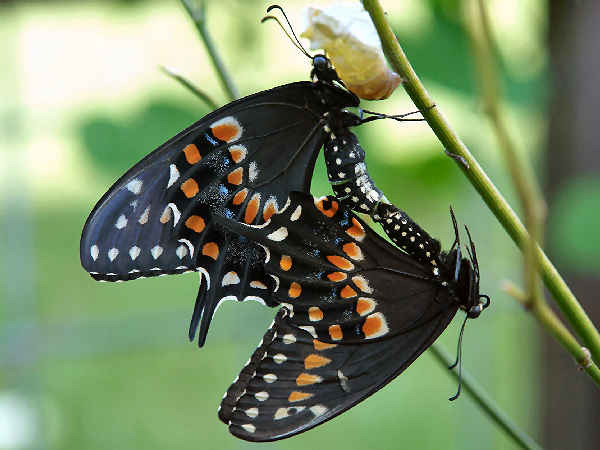 The picture shows a pair of Spicebush Swallowtails. They are one of the four species with dark wings. Identifying the four species can be tricky. Take a top of the wings view and a side of the wings view for the best field identification clues. If you are looking at the Spicebush Swallowtail from a top of the wings view, there are light blue/white marks around the edges. If you are looking at it from a side view of the wings take a look at the orange spots. There are two rows. The abdomen also has dots on it. The Little Metalmark is the state’s only species.